Earlier today I was reading an article in the Lowell Sun about a “major” drug dealer arrested and charged with a multitude of drug and gun crimes. A suburban task force targeted a twenty-eight year old Groton man, Shane Conley, as dealing various controlled substances. Armed with a search warrant the police entered Conley’s home yesterday and found pills and marijuana. 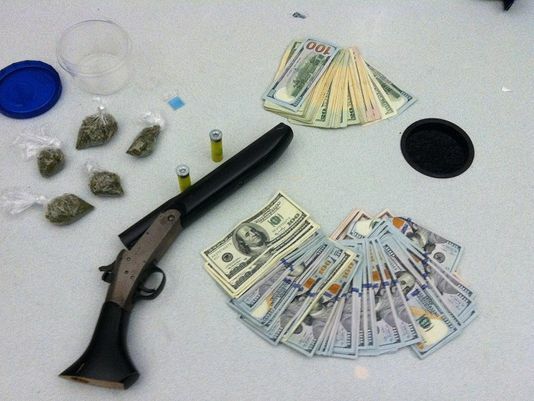 The total amount of drugs seized was insufficient to charge Conley with trafficking. Also found during the search was a sawed off .22 caliber rifle and some ammunition. Mr. Conley was charged with possession with intent to distribute Class A, Class D and Class E drugs as well as possession of a firearm. The case is currently pending in the Ayer District Court. Despite being viewed as a big case, not all major Massachusetts drug dealers will serve jail time. Perhaps the same will be true for this defendant. While mandatory minimum sentences tend to limit defenses in drug cases those matters that do not involve minimum mandatories give judges great discretion. In many previous posts I have commented that newspaper articles often exaggerate or glamorize arrests. And yes, this might be a big case for the town of Groton. But lets face facts. Drugs cases that cannot be charged as trafficking offenses just aren’t that big. Possession with the intent to distribute Class A drugs or Class E drugs are felonies. However, a judge can continue these matters without a finding. Possession with the intent to distribute Class D is a misdemeanor. The truth of the matter is that the bigger case here is the gun case. For many gun charges there is a minimum mandatory eighteen month sentence. In this matter, given that the saw-off shotgun was in Conley’s home there may be no minimum mandatory sentence and again a continuance without a finding (cwof) might be available. What Factors Do Judges Consider When Sentencing on Guilty Pleas? Whenever a judge has discretion in terms of sentencing you want to make sure you have an experienced lawyer. Your lawyer has to make sure the judge knows the “value” of your case. Your lawyer must educate the judge on who you are and what the case is all about. When sentencing defendants, judges look at your criminal history, the nature of the crime, other sentences that are being imposed in their court and other Massachusetts courts with similar facts, your danger to the community, the likelihood of your reoffending, the strength and weaknesses of the case and more. Judges want to be comfortable with their decisions and it is the obligation of the criminal defense lawyer to make them understand what a fair sentence is in the particular case. Massachusetts has an informal set of sentencing guidelines that can also be shared with a judge at the time of a change of plea. Keep in mind also that in the Massachusetts District Courts pleas are “defense capped pleas” meaning that a judge will not sentence you to more than your lawyer requests without first giving you the opportunity to withdraw your guilty plea. No matter what crime you are charged with you want to make sure you hire the right lawyer. You want to hire an experience lawyer with a history of successful results and wins. If you are in trouble call us at 617-263-6800. We can help you.